The race for the English Premier League title has reached a critical stage as the Sunday results have put Manchester City within 3 points of their cross-city rivals Manchester United. The two teams will square off this Monday at the Ethiad Stadium in a matchup that will likely determine this season’s EPL champion. Manchester City hold the important 6 goal advantage in goal differential, which will give them the title should City and United finish level on points. This new excitement in the Premier League race comes after Everton fought back from a two goal deficit to earn their hard won point. Nikica Jelavic made his mark on the game early, after having a couple early opportunities; he made the most of Tony Hibbert’s cross and floated his header over David De Gea and into the net. After conceding the early goal, United were eager to draw level again and Paul Scholes nearly had a deflected effort end up in the net, but good positioning from Tim Howard prevented the equalizer. 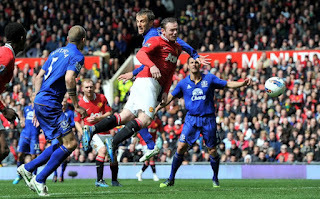 Despite their best efforts to go into the half level, the Everton defense faltered and allowed Wayne Rooney enough space to find the goal with a 41st minute header with the assist coming from Nani. Just a couple short minutes later, the halftime whistle blew and both sides headed to the dressing rooms level at 1. 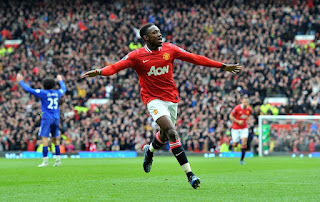 The second half deluge of goals began with Danny Welbeck, who after a scramble outside of the penalty area, maneuvered his way into space and fired a shot past Tim Howard for the go ahead goal. Manchester United added to their lead just three minutes later thanks to some fantastic passing that ended with Nani slotting home the finish. At this point in the match, Manchester United looked to be in the clear with a 3-1 lead. 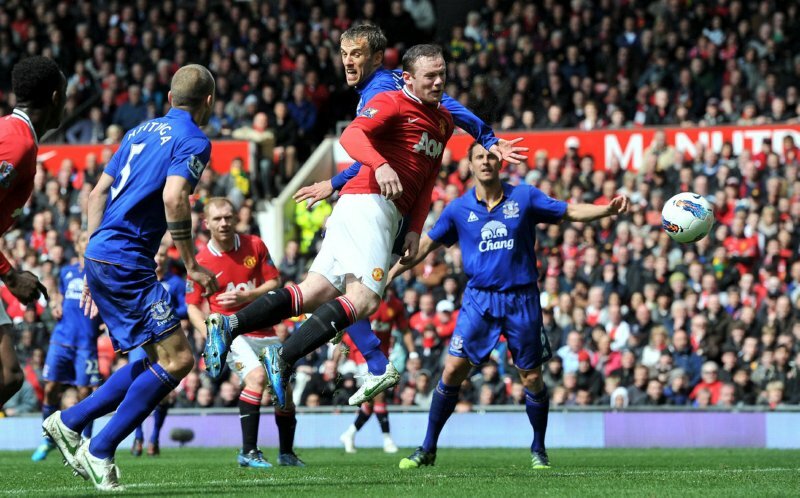 Everton immediately responded to the third United goal, with a one of their own. Marouane Fellaini fired a first time shot off of another Tony Hibbert cross and suddenly with the score 3-2 the match was tightly contested again. Just after the restart, United again found themselves in a dangerous position, but Steven Pienaar’s attempt was stopped by De Gea, giving United a moment to breathe. United chose to press forward rather than defend their lead and in the 69th minute Wayne Rooney added to his earlier tally thanks to a brilliant run of play ending with Rooney’s finish from a very nice Welbeck assist. In that frantic stretch of play lasting 13 minutes, the fans saw 4 goals with Manchester United increased their lead to 4-2. Their continued aggression was almost rewarded, but Evra’s header only met the goal post, which would be critical given what was about to come. In the 81st minute, a failed clearance from Rio Ferdinand and Jonny Evans fell to the feet of Nikica Jelavic, who pounced on the opportunity and added his second goal of the game. Everton was far from giving up hope and their continued fight was rewarded when Phil Neville, Fellaini and Pienaar linked up to create the equalizing goal. It was a beautiful passing display truly worthy of such an important goal, and gave David Moyes’ side the result they were seeking. As Manchester United returned to the center circle dejected, the match was not over yet as in the 5th minute of stoppage time, Rio Ferdinand forced Tim Howard to make a save on what would a have been the winning goal. Despite their best efforts, a win was not in the cards for either team and the draw meant the door had been left over for Manchester City who was taking on Wolves later that afternoon. After learning of their cross town rivals result, City gave an appropriate response by immediately seeking a win in the early moments. Carlos Tevez’ set the tone with his first attempt on goal coming just 17 seconds after the opening kick. Both teams exchanged chanced in the opening minutes with a Sergio Aguero effort trickling just wide of the goal and David Davis forcing a nice save from Joe Hart. The best opportunity of the opening minutes fell to Samir Nasri, but the Frenchman wasted it by putting a shot wide. Sergio Aguero managed to recover from an earlier opportunity he had scuffed wide by making the most of a beautiful through ball from Gael Clichy to open up the scoring for Manchester City. It was a stumbling finish from the league’s third leading scorer and a well-earned goal by City that gave them the early lead. Manchester City looked good value for their lead throughout the match with Wolves’ best effort, a header from Steven Fletcher, being turned away by Joe Hart. A wasted corner from Wolves, led to a break which saw Carlos Tevez pulled down and City awarded a free kick. The kick was quickly taken and the ball returned to Tevez who set up Samir Nasri who was open in space and finished it past backup Wolves keeper Dorus De Vries. Manchester City squandered a handful of opportunities throughout the game, including a late miss from Sergio Aguero, but 2-0 was enough to give them the 3 points they so desperately desired. Their win over Wolves sets the stage for what will surely be a derby day to remember on Saturday. With so much on the line including the Premier League title, the matchup between these two clubs is eagerly anticipated by all. 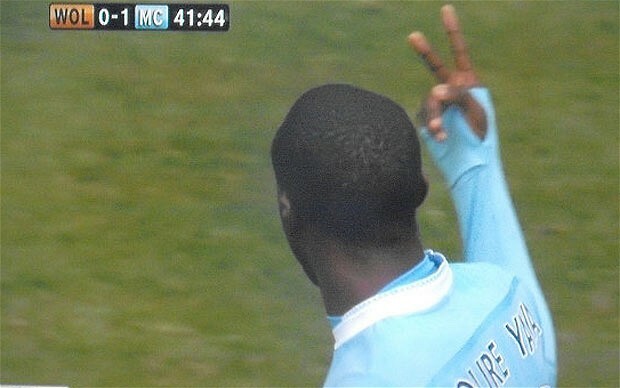 The stage has been set, but controversy now revolves around Yaya Toure, whose gesture shortly before halftime could earn a suspension. More on that later in the week though. Pienaar gets the background today for his timely equalizer. No match notes today, you're all just going to have to listen and enjoy.